“Linda was awesome today!” Stephanie beamed like a 100 watt bulb. The two women in our group bubbled and burbled but wouldn’t talk to me. Sunday morning in Richland was cold but sunny after the chill drizzle all day on Saturday. We had all just returned from our road test. Linda hadn’t slept but a couple of hours since Thursday at home. I had slept a few more than she. We were all exhausted, but happy, I thought. “She’s in a better frame of mind today than last night,” I told someone. I didn’t know that the exuberance was nervous energy. As far as Linda was concerned the seminar was over for her. If she hadn’t been so exhausted, she’d have gone looking for a quilt shop. Instead she stayed to finish out the last instruction about marketing your class, getting insurance, finding a place to hold your class. She also stayed to observe the remaining five candidates do their modules for a grade. In her mind she had presented her module on the road and would be doing nothing more. 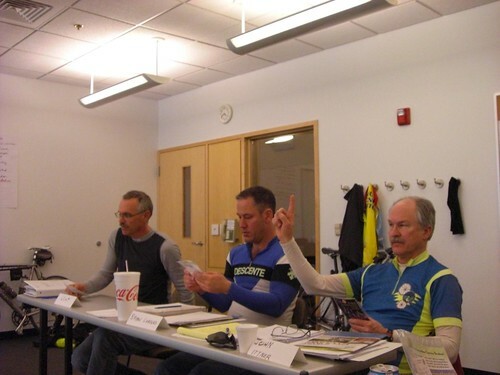 The League of American Cyclists offers a series of classes covering handling and avoidance skills on the bike, road positioning, principals of law as it applies to cyclists, maintenance, nutrition, fitness and much more. Last spring Linda and I joined Scott and Jen Trost to take the first level course then called Road I but now Traffic Skills 101. I thought I’d like to become a League Certified Instructor from the first time I read about the program before I retired some years ago. Finding a Road I class nearby was tough enough, but finding the seminar was even harder. Well, for me because I’m reluctant to travel to the coast where, evidently the cycling community is not only active but well, let’s just say assertive. Linda surprised me by deciding to do the program too. That would make it more comfortable for me and I encouraged but did not press her to join. From the start confusion reigned. Would the classes be in November as planned? We received our course materials, a large white notebook, a small text, and several videos sometime in October and were told to send in the pretest before the seminar. When I enquired where to send the tests, I learned the seminar had been postponed until March. No one had thought to let me know or maybe they had and it had gotten lost? I doubt it. Others had similar experiences including not receiving assignments before the class. Yes, assignments. Based upon our performance on the pre-test, our profile, and instructor whim, we were each assigned one of 22 modules to teach. We’d have 10 minutes to do so. We also got to select a second module to “practice teach.” In addition we’d each get to teach several bike handling skills in the parking lot. Did we need to bring handouts, videos, slides? We received the assignment only Monday before the Friday through Sunday seminar. Limited time to prepare for one old retired guy with nothing much to do but ride a bike, but nowhere near enough time for anyone with a life and job. What could they be thinking? We all respond to stress differently. The six of us got a chance to learn that this weekend. Who shows up for this kind of abuse? Stephanie is employed by the Cascade Bicycle Club to do community outreach. Being an instructor fits her job description pretty nicely. Bryan and Clint work in Walla Walla in IT. Bryan raced when he was younger and Clint is on a pretty successful Cat 4 road racing team right now. Parking lot drills; no sweat. John on his recumbent, treasurer and webmaster for the Tri-cities club, is a veteran of bicycle advocacy battles and a retired nuclear engineer. 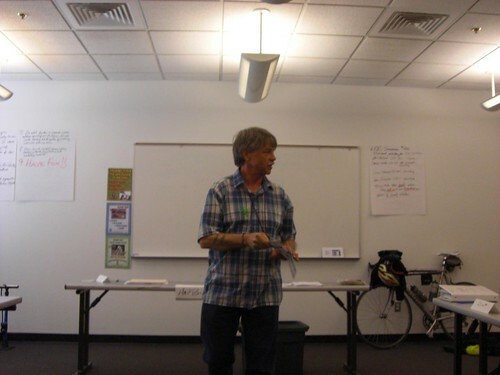 Hal Ballard was our coach and brought with him from the Portland area an assistant LCI named Jason who had just gotten his certification and was doing his required additional co-teaching to become fully certified to do his own classes. Damian Miller comes from the east coast but moved to the Tri-cities in 2008 with his wife whose job in food nutrition brought them here. He comes with a long list of bicycling credentials, bills himself as a mountain biker at heart, runs a small business teaching cycling skills including a Park Tools class, and chooses to live and work as much as possible without using a car. He is working on a degree in early childhood education. He is slender about 5’9, soft spoken, never perturbed, but fierce and articulate about bicycling. “I owe it to you to start on time,” Hal said at 4:30 Friday afternoon. And he did, though we numbered only four at a table set for eight. Where the communication had been confusing, Hal’s intent was plain. This was going to be about business no matter how much fun he enjoined us to have. Bryan and Clint arrived shortly. A sixth candidate from the Tri-cities never showed up much disappointing Damion whose goal is to get as many LCIs in his area as possible. The eighth seat belongs to the local bike club and can be used at another seminar. Had they not paid for that seat, there’d have been no seminar. Cycling classes are rare in eastern Washington. Everyone knows how to ride a bike, or thinks they do. And cycling density is pretty low. Turns out getting people “out of their cars” and onto bikes is not just a service but an advocacy of its own. Linda and I have joined the revolution, it seems. And it wasn’t just learning the rules of the road or how to do an instant turn. The seminar was chock-a-block with how to plan and present engaging classes. Everyone in the room had teaching experience in one way or another though only I have been a public school instructor. No one was shy or afraid to speak their minds. And, although, Hal ran a tght ship, cutting you off at 10 minutes for example no matter what you hadn’t got to, he still entertained much give and take except as to the answers to the pretest and the helmet controversy. Those two items would have been time-sinks for sure. Saturday we convened at 8 am under cold grey skies at a parking lot along the Columbia river. Cyclists in ones, twos, and groups barreled along paying no attention to the small band with the funny halved-tennis ball courses set up. We practiced teaching and being taught. Clint always volunteered to go first all weekend even after the immediate trashing he took giving instructions on how to stop on a bike. And we thought we knew how to ride? Trashing is too harsh a word. Challenged would be better. Clint had chosen to give an instruction that contradicted the League’s explicit direction. Hal challenged it. He didn’t say it was wrong. Even said he also did the same, but he demanded to know why and accepted nothing that made no sense. When Hal got done with you, you were wiser, chastened, but could still do it your way so long as you knew how and why you had diverged from the league manual. Clearly something interesting was going on here. Clint took it well and it wasn’t blistering; just deflating. Everytime we did anything we were subject to a round of criticism by candidates, LCIs and Hal. To be fair, The LCI’s were subject to the same and the formal sessions concluded with a round for Hal, himself. This was a real seminar of colleagues seeking to learn from and improve one another. We would have to be strong, thick skinned, and on our toes but dissenting opinion wasn’t going to be personal and would be hammered on until resolved. This extended to the LCIs and Hal. I discovered some differences in the road-ride. Saturday I was too timid and yielding to traffic; Sunday too assertive and discourteous. Could it be both? Yes, road situations change based on traffic, weather, light but what was the answer? The answer is I have to know the rules and why they exist and why and where they apply but I have also to make judgment calls on the road for the conditions. You cannot apply one rigid always-works solutions to riding in traffic but you had better fully understand the principals and follow them. Some room for disagreement among colleagues—not much, but some. I loved it but it did see me receiving a good deal of critique. And I thought I knew how to ride. The parking lot drills on Saturday were practice. We’d be back on Sunday with less guidance from the LCIs and would be graded. Next came the road ride on a course on Richland city streets incorporating a roundabout several stops, left turns, and a major high-speed intersection. Sunday we’d ride it again for a grade. And finally the presentations in the classroom. The assigned module we’d do on Sunday for a grade but we’d practice with the self-selected one on Saturday. Clint and Bryan hadn’t seen the module list until Friday. They’d have no time to prepare anything. I, at least, had snatched slides from Jen’s power point we’re using for our May Smart Cycling class. I selected a module that fit some slides and did nothing more. I put the slides on a thumb drive in hopes I’d find a laptop and projector available. They were, however, I’m glad that I had, at the last moment, decided to bring my own laptop. After the Friday night session, Linda and I returned to our room at the Hampton. I fired up the laptop while listening to Linda rehearse helmet-fit. I read through my slides, deleted some, moved them around and did a run through with Linda. It sounded wonderful to me. I was using language from the “need to know” material and had a beginning, middle, and end. In bed, neither of us could sleep. Linda had a cold, the sniffles and a cough and was rehearsing her module in her head just as I was. I probably slept six hours. Linda got up and did yoga. I suggested later she’d have gone to sleep if I’d turned on a movie. We were not alone, I’m sure. And Saturday’s modules were just practice. We’d have to do it again on Sunday with different material and no class time to prepare. Oh, and class was scheduled to go to 8 at night with no time in there for dinner. Meals seemed to be optional. In my mind I was smooth, articulate, and covered all the bases in my presentation. And I had powerpoint. But on Saturday, I had only just started when Hal signaled only 3 minutes to go. I raced through the slides leaving out all the cool language references to League material that I was sure was going to impress everyone and still didn’t finish. I was not alone. No one finished. But we were critiqued nevertheless and we’d get to do it again on Sunday. Humiliated on the skills course, missed lanes on the road ride, and a presentation overblown and underdone. And that was just me. Everyone had their own devasting day. Linda’s included a bad experience at a left turn at dusk on wet streets. Were we having fun? A cold beer at some place called Atomic Ale helped and then back to the Hampton. I ruthlessly stripped out slides in Sunday’s module—10 minutes turned out to be pretty short, and then maybe get some sleep. Tonight the slide show gives me a break until about 5am. Linda’s doesn’t. She’s doing the ABCQuickCheck which should be pretty easy and seems to have recovered from her traffic experience, but her mind doesn’t rest easy and she goes another night without sleep. No one including LCI’s are as rested as they’d like to be when we meet again for the parking lot test. The sun is shining which is an improvement over Saturday’s grey and drizzle. The wind has come up and is chill. We are in two groups but I hear Linda struggle but she seems to be laughing too and I return to my own problems with balance and lean in the weave and instant turn. She hasn’t told me yet that she has quit. She has had a long session with Hal and has agreed to retake Traffic Skills l01 and get certified later. At this moment she no longer cares about being an LCI. That won’t last. 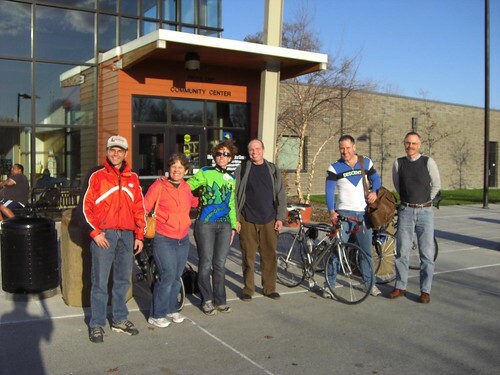 We talk for three-hours all the way home about plans to provide cycling instruction at the Easy Does It train for I Made the Grade rides and about speaking to community groups and how our community needs different content than a Portland or even a Richland class. We’re still talking in bed later; still sleepless. Back in class everyone’s presentations come in on time and nearly all are vastly improved but instruction is not over. We are not clear on Speed Positioning and Damian will have it out of us. Frustrations blossom but tempers stay contained and remain in critique mode. The group has gone through its trial by fire. We have created something that didn’t exist before and this final trial has sealed the deal. We’re still learning; and all but Linda become level 3 instructors. We must continue to learn by co-teaching for a time before we leave the nest. Damian has agreed to take Linda and me on. And we have a new community of cycling friends and colleagues. It took a weekend of hell and fun to do it but we all, even Linda, feel strongly that each of us is more confident and better prepared to advocate for bicycling by teaching people the skills and knowledge that will allow them to stay on a bicycle for life.